Due to the fact that I wrapped up most of the games I wanted to complete in 2013 right at the end of the year, my early 2014 playthroughs are still currently underway. 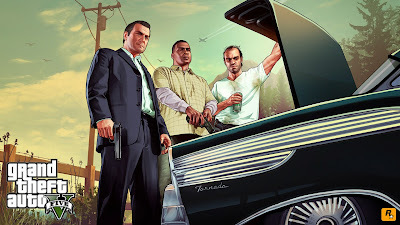 Grand Theft Auto V is easily one of the more expansive and longest-running of this early slew of titles, and should be one of the first games I post a review for this year, alongside The Legend of Zelda: A Link Between Worlds. Aside from those two titles, I received Super Mario 3D World and Batman: Arkham City Armored Edition for Christmas, and still have Pokémon Sapphire, the original NES Legend of Zelda, Persona 4, and a couple of Final Fantasy titles I intend to return to this year. I’m actually quite a ways into Persona 4, and feel like that game will become higher priority during this winter/spring season than some of the others, due in part to the fact that I haven’t very far to go before completing it, and the fact that the game has been on loan to me from a friend. As far as the outlook for the rest of the year is concerned, I really can’t throw out a whole lot of concrete details, simply because I don’t really know what to expect from 2014 with regard to new games. I do intend to pick up Watch Dogs day of release for the Wii U, and I’ll definitely get Kirby: Triple Deluxe. The new Smash Bros. is also a guaranteed purchase for me, though currently, signs point toward that being a quarter three or quarter four release. Bayonetta 2 (as well as a playthrough of the first) stands as a moderate possibility – the game looks cool, no doubt, but I really haven’t been particularly impressed with Platinum as of late, as evidenced in most of my posts from 2013 detailing hands-on experiences with some of their games and demos. I would like to pick Final Fantasy VII back up later this year, as I truly did enjoy what I played in early 2013. Final Fantasy X did not impress me nearly as much, primarily due to the displeasing battle system and lack of many useful characters. I own copies of both Final Fantasy V and VI that I have yet to start files on, and I clocked a few hours into Final Fantasy IV: The After Years at the end of the summer. Though I realize it isn’t classical RPG in any sense of the term, I’m quite a ways into Paper Mario, and have simply been taking my time with that game, picking it up and clocking in a couple of hours here and there, as I feel like it. There’s a very good chance that title will see a review from me by the end of 2014. The only other game that currently comes to mind as a potential purchase for this year is Killer7, which is a game I’ve wanted to experience in proper for quite a few years now. With that one, it’s really just a matter of finding a reasonable price for a used copy. I have absolutely zero intention of purchasing either the Xbox One or the Playstation 4, so I will write off any potential reviews from those consoles here and now. From this point out, my reviews of new-school games will be fueled by the Wii U and 3DS, as well as the Xbox 360 and Wii for those odd titles I never got around to playing in proper when they were first released. I suppose DmC might be worth mentioning as having a better-than-decent shot at seeing a review later this year, and Ghost Song is one indie title I've had my eye on since Two Best Friends Play made mention of it on their Facebook page. As for the rest of the year, I guess we’ll just have to wait and see what lies in store.